Kampfar – New Single and Lyric Video – Burning Fist! January 10, 2014 January 20, 2014 • Burning Fist! 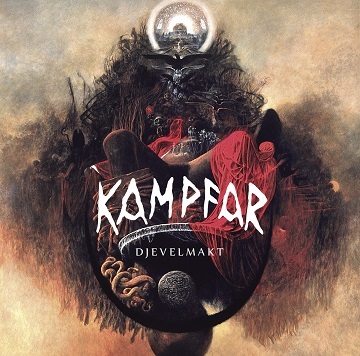 Critically acclaimed metal-veterans Kampfar will, with their coming release “Djevelmakt”, take one step closer to the Black Metal Throne. The first single “Mylder” is already out and today they’ve released a new single: “Swarm Norvegicus” – It is available on digital services like iTunes, Spotify and WiMP as well as Soundcloud. The release date for the album “Djevelmakt” is 27th of January world wide and 31st of January in G/A/S. Preorder the album, bundles and limited editions HERE. You can also check out the bands facebook page and stay tuned for news on the album and upcoming gigs. BurningFist will have a full review of “Djevelmakt” soon! Posted in Metal NewsTagged Album, Atmospheric, Black Metal, Djevelmakt, Epic, Extreme, Extreme Metal, Kampfar, metal news, Music Video, News, Stream, VideoBookmark the permalink.